Sub: Rationalisation of cadres – Reduction in AAO cadre – Reversion of Supervisors in field offices – reg. Kind attention is invited to the subject cited. 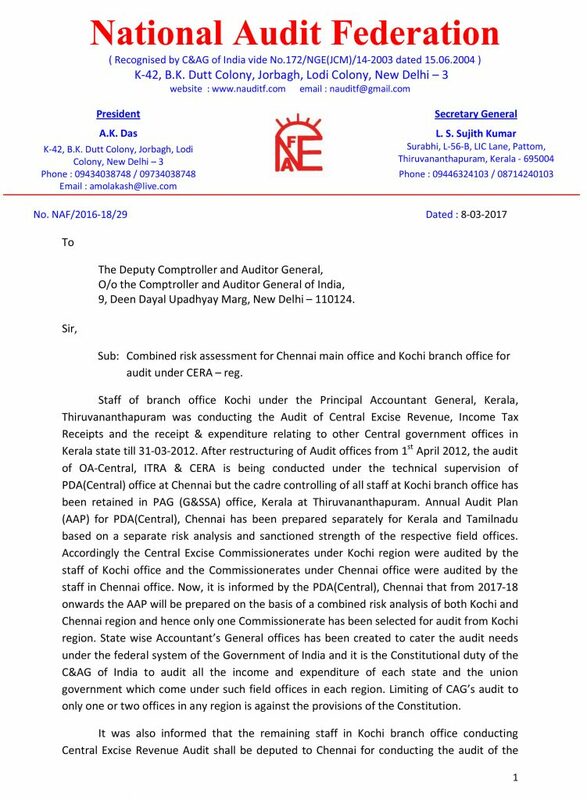 It was communicated by the Principal Director (Staff) vide letter dated 03-10-2016 that the cadre strength in the Audit Offices (Civil, Commercial, Defence, P&T and Railway) has been rationalised so as to provide optimum number of officials at various levels to fulfil audit mandate. 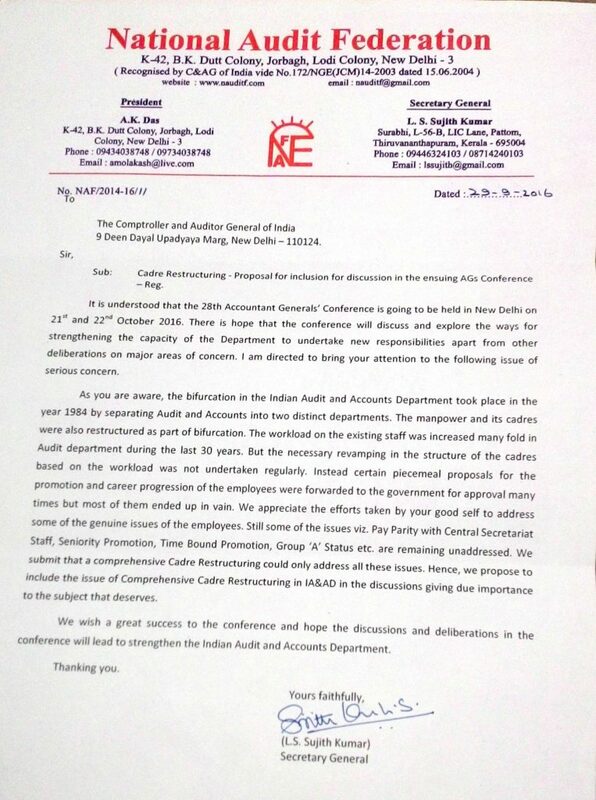 The letter itself stated that there will be reduction in AAO/Supervisor and Auditor/Sr. Auditor cadres. We have already recorded our discontent through our letter No. NAF/2016-18/19 Dated 11-11-2016 (copy enclosed for ready reference) and requested the CAG to issue direction to revisit the present rationalization process and to have discussions with the representatives of recognized federations. On 23rd November 2016, during an agenda meeting with the Dy. CAG we have clarified our stand and informed the DAI that the employees of IA&AD are demanding for a Comprehensive Restructuring of all cadres rather than Rationalisation of specific cadres. On our request, it was assured that a committee will be constituted for Cadre Restructuring and representatives from all federations will also be included in the committee. But no such committee was constituted till date. Now, within a few months from the implementation of the rationalisation scheme, its adverse effects have started reporting from field offices. Headquarters office in order to increase a few posts in the AO/Sr.AO cadre, has reduced the cadre strength of AAO/Adr./Sr.Adr. drastically in many offices. This has adversely affected the functioning of the field offices which are already running short of AAOs. Moreover this has affected the promotion scope of the officials who have recently passed SAS exams. In many field offices, Supervisors who were temporarily promoted due to shortage in AAO cadre has now been reverted stating that the office has now become surplus. Interestingly, the situations in these offices are deliberately created by reducing the cadre strength in the name of Rationalization. In Kerala, 6 such Supervisors were reverted to the post of Senior Auditor and in Jharkand five Supervisors were also reverted. At this juncture, I would like to bring to your notice that during an agenda meeting with DAI it was assured that “keeping in view the huge vacancies, reversion of Supervisors is unlikely. However, if specific proposals are received to create a supernumerary post from any office, the same will be examined”. Hence, it is requested to allow all such Supervisors till their retirement on supernumerary posts as these offices are in fact running shortage of AAOs to perform the constitutional duties. An act of kindness from your side will only help the staff to avoid financial loss as well as mental torture. Further, Due to the non-operation of unilateral transfer facility in our department many AAOs are working in their respective home states on deputation basis. During discussions with DAI in many occasions, we have raised the issue of lifting of ban on unilateral transfer. DAI has clarified that lifting of ban on unilateral transfer is not feasible for the time being but it was assured that those officials on deputation will be allowed to continue till their retirement, if they desires. Now, many offices have started issuing notice to the deputationists stating that they will be repatriated to their parent office on completion of their present term of deputation due to reduction in AAO cadre after rationalisation. 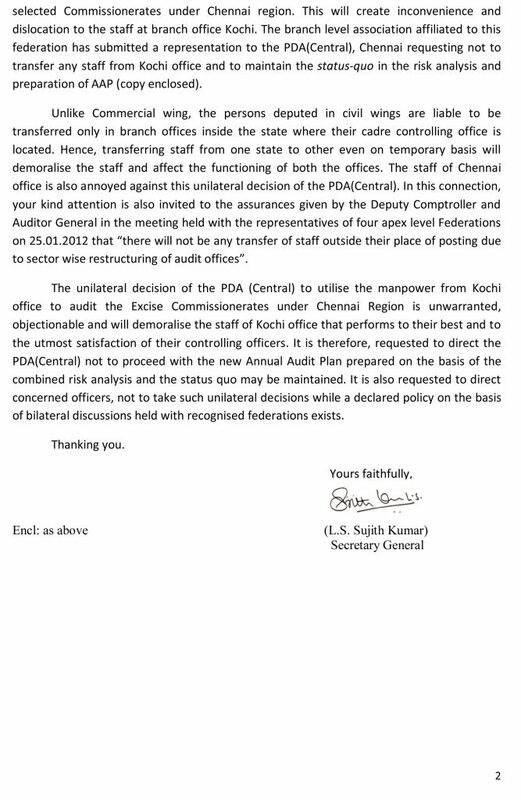 Audit office in Kerala is one among them, where notice has already been served to four such officials. Most of the deputationists are almost settled in their home states on the assurances given by DAI to this federation and repatriating them on any ground will only to disturb their mental strength, education of their children, the financial stability and above all their family setup. This will also adversely affect their performance in audit. We request the CAG to take a lenient view on this and to allow them to continue in their respective home states on deputation/unilateral transfer. Similarly, many Audit offices are facing it difficult to promote the SAS passed candidates due to the reduction in AAO cadre. In Audit office Bihar, 33 posts of AAOs are reduced while as many as 35 SAS passed candidates are awaiting promotion. In Kerala office 94 posts of AAOs are reduced while 18 SAS passed candidates are waiting for promotion. Those candidates after seeing huge vacancies in the AAO cadre in their respective offices put all their efforts and came with flying colours only to see their future vanished into thin air. In this circumstances, it is pertinent to bring to your notice that the minimum period of service for appearing SAS Exam was reduced recently from three to two years in order to induct more youngsters and to fill up huge vacancies in Audit offices. The forceful reduction in cadres has torpedoed the true spirit behind the relaxation of service period for appearing in SAS examinations. It is therefore requested to direct the field offices to promote all the SAS Passed candidates as AAOs without delay considering the pre-rationalization cadre strength or by creating Ad-hoc/temporary posts, if needed. In Maharashtra, 25 posts were increased in AO/Sr.AO cadre as per the revised cadre strength/rationalization. But, it is reported that even after repeated requests from local associations at Mumbai and Nagpur, the Principal Accountants General (I & II) have not initiated action till date to promote eligible AAOs, even after three months of issue of orders. Hence, it is also requested to issue directions to the Accountants General (I&II), Maharashtra to promote all eligible AAOs immediately. In IA&AD, the promotion prospects of the employees are very low compared to that of other central government offices viz. Central Secretariat, Central Board of Direct Taxes, Department of Customs and Central Excise etc. This has also attributed to the migration of IA&AD staff to other departments after getting much training in this department resulting in loss of money and manpower to IA&AD. In order to mitigate erosion of manpower, this federation has demand for a Scientific and Comprehensive Cadre Restructuring of IA&AD. Issue of Rationalization of cadres has already created panic in the minds of audit staff and it is understood that a similar rationalization is also in the pipeline for the Accounts offices. In the circumstances, we request the Comptroller and Auditor General of India to grant us a meeting to brief the need for a Comprehensive Cadre Restructuring in IA&AD. 9-Deen Dayal Upadyaya Marg, New Delhi – 110124. Sub: Request for grant of an urgent meeting. An agenda meeting was held with you on the 23rd November 2016 on our 13 point charter of demands submitted along with explanations. The meeting was very cordial but not fruitful. Though certain assurances were given in the meeting, the same was not seen reflected in the record note forwarded vide letter No.551-Staff(JCM)/1-2016 dated 14-12-2016 by the Sr. Administrative Officer (JCM). Moreover, many of the demands were seen ‘treated as closed’ unilaterally. The working committee of this federation held on the 22nd and 23rd January 2017 in Hyderabad, discussed the outcome of the agenda meeting and observed that the CAG administration is very much prejudiced and predetermined on the genuine demands of the audit staff. The Working Committee has expressed its strong discontent on the pessimistic attitude of the headquarters office. Members of the committee has strongly conveyed the feelings of the audit staff in field offices and informed that the staff by and large are in the path of agitation to achieve their genuine demands. Hence, the Working Committee, after much discussion, has directed to discuss the following selected five demands with the Deputy CAG urgently for an early settlement. Ever since our inception, we have conducted several agitations in field offices and also staged many dharnas in front of CAG office/Jantar Mantar. But, the National Audit Federation always believes in bilateral negotiations rather than going on agitation. For us agitation is only a last resort. I therefore request you to grant us an urgent meeting to discuss above five demands as early as possible so that the discontentment prevailing in audit employees may be minimized, if not defused. Apart from above the following demands identified by the working committee meeting which are related to 7th CPC report for which GOI/MOF may be approached by our department. Sub: Forwarding of resolutions passed in Hyderabad Working committee held on 22nd and 23rd January 2017. I am directed to forward copies of the resolutions passed in the Hyderabad Working committee meeting of this federation held on the 22nd and 23rd January 2017. I request you to take urgent necessary action to settle the genuine demands of the employees of India Audit and Accounts Department submitted through the enclosed resolutions. I request you to take urgent necessary action for the implementation of the above demands. Sub: Delay in publishing of SAS/RAE/IE/CPD examination results – personnel intervention sought for. The most recent departmental examinations for Subordinate Audit/Accounts Service Exam, RAE, Incentive exams and the CPD exams were conducted in September 2016. Since then, the candidates are eagerly waiting for the publishing of its results. But till date the results have not published. This is the first time after introduction of the Computer Based Test, that the result is getting delayed for more than three months. 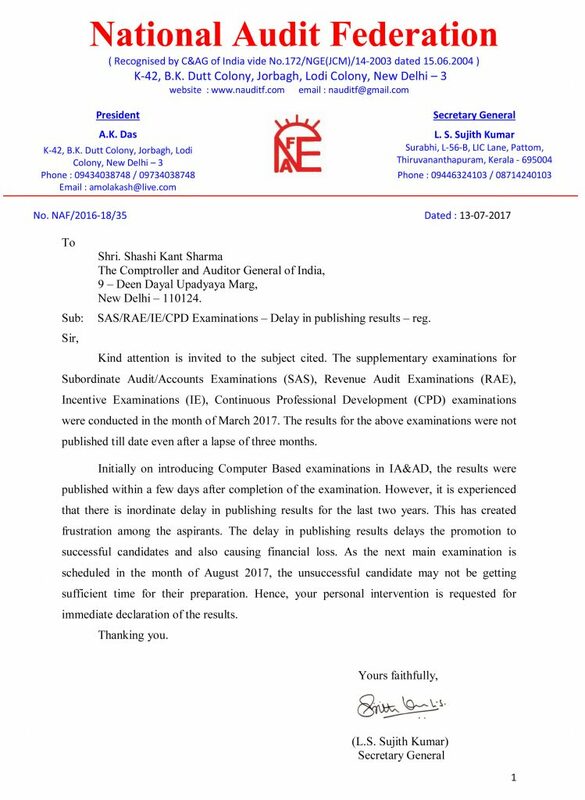 Inordinate delay in publishing result of a computer based test is not justifiable. Hence, it is requested to intervene personally and to direct the concerned officers to publish the results without further delay. Early action in this regard is highly appreciated. Thanking you and Wish you a very happy New Year 2017. Sub: Invitation to inaugurate the working committee of NAF – Invitation. As informed by Shri. Bandhopadyay, the Working Committee meeting of this federation is scheduled to be held on the 22nd and 23rd January 2017 at Hyderabad. The Category II & III associations in the office of the Principal Accountant’s General (Audit) office, Andhrapradesh & Telungana at Hyderabad are the joint hosts of the meeting. I am directed to invite you to inaugurate the Working Committee meeting on the 22nd January at 10.30 am. Venue for the meeting is Vasavi Seva Kendram, Lakdikapul (Opposite: Sensation Theatre). I also request you to address the gathering and enrich them with the recent developments in the national level relating to the common cadre demands of the employees of the organized accounting departments (Railway, Defence, P&T, Civil Acounts and the CAG) under the Central Government. Sub: Official Minutes on the meeting held on 23-11-2016 with the representatives of NAF – differences noticed – reg. During discussion you have assured that, the reduction of posts in certain cadres due to rationalization will be doubled in near future. You have also assured that the reduction in posts will not have an immediate effect as it is directed to continue with the present recruitment plan and to promote successful candidates in the current SAS examination as per the sanctioned strength as on 31-3-2016. It was also agreed to constitute a committee for comprehensive cadre restructuring and directed to include representatives of all the recognised federations in the committee. But in the record note none of the above assurances are included. During discussion, it was informed that the re-organisation has attained a state of finality and cannot be revisited at this stage. However, you have agreed to review specific issues, if any, pointed out by the federation. But, this assurance is also seen omitted in the record note. In the record note, it is stated that the “federation was intimated that as per approved policy of the department on sports quota, recruitment in only five disciplines (Cricket, football, hockey, table tennis and badminton) has been included. This is aimed at excelling in few selected sports. Therefore, the demand to include Volleyball in the recruitment list is not feasible”. But, during meeting you have stated that “presently recruitment process for 5 sports/games disciplines are going on and once sufficient members are recruited in each office; the inclusion of volley ball will be considered”. Further, it is stated in the official minutes against many of our demands that “the agenda item may be treated as closed”. It may please be noted that you have neither made any such statement nor directed to close any of these items during the meeting. Changing of decisions taken / assurances given in a high level meeting of officials affects its good faith. Hence it is requested to issue directions to review the record note. 9, Deenadayal Upadyaya Marg, New Delhi – 110-124. Sub: Allotment of berth to National Audit Federation representatives in the Staff Side – JCM – reg. In response to your letter No.391-staff(JCM)/53-2016 dated 6-9-2016, I am enclosing a list of affiliated unites under National Audit Federation along with the membership position as on 1-07-2016 for necessary action. Sub: Demonetisation of 500 & 1000 rupee notes – all payments through cash – request thereof. The Government of India has demonetised existing 500 & 1000 rupee currency notes w.e.f. 9th November 2016. Though this decision of the government was welcomed by the people of India, the aftermath of its implementation shows it has created many problems to the common man. Audit staff entrusted with audit duties is also facing various problems. As they have to make enormous travel throughout the month in order to execute their assigned duties, the present exchange facilities and limitation for cash withdrawal is adversely affecting them in meeting their day to day expenditure. In order to mitigate the present situation, we request the CAG of India to disburse salary and all other payments in cash to IA&AD staff till January 2017. 9 Deen Dayal Upadyay Marg, New Delhi – 110124. Sub: Rationalisation of cadres – reg. Letters were issued from the headquarters office recently to many of the civil audit offices regarding the rationalisation of staff strength in Audit Offices. It is observed that a good number of posts in the cadre of Sr.Auditor/Auditor and the AAO/Supervisor are reduced and a few posts were increased in the AO/SAO cadre. In this connection, kind attention is invited to the circular dated 3-10-2016 wherein it was stated that as part of the cadre restructuring process, the department has finalized a short term plan and a long term plan. While the long term plan shows an increase of 27108 posts in the three major cadres’ viz. SAO/AO, AAO/Supr. and SAdr/Adr, the short term plan shows a decrease of 3774 posts resulting in to reduction of staff in the AAO/Supr. and SAdr/Adr cadre. It is also mentioned that the department has already initiated the process of recruitment against the vacant posts. National Audit Federation was demanding for a comprehensive cadre restructuring of all cadres in the department, since 2008. Now we are glad that atleast the process of cadre restructuring in the department has reached the implementation stage. The ratio between the three major cadres fixed and approved by the CAG of India as 1:2:2.5 is also acceptable to this federation. But it is noticed that there is huge reduction of posts in the AAO/Supvr. and SAdr/Adr cadres in almost all the offices where revised sanctioned strength are circulated. Field offices have reported that there is surplus staff in both the cadres as per the revised Sanctioned Strength. 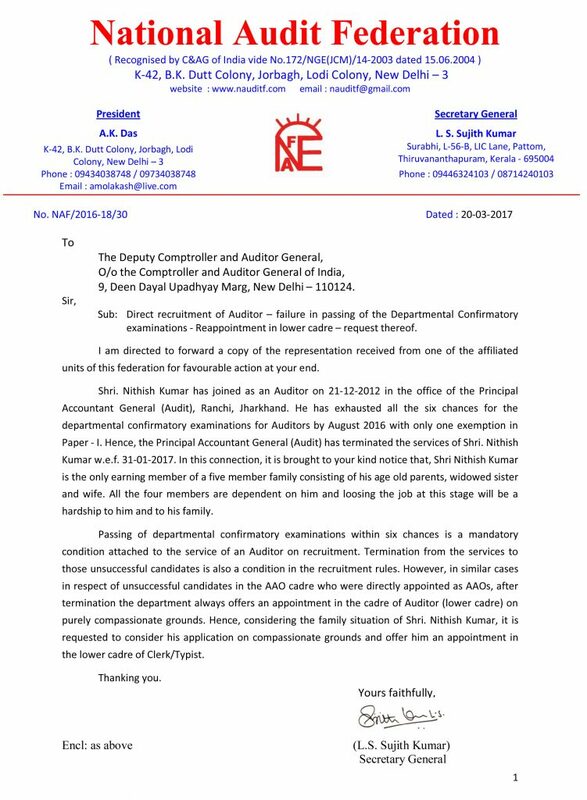 It is also reported that the dossiers received for the appointment of Auditors are kept pending due to the curtailment in sanctioned strength. I am directed to convey that the present cadre rationalisation is only a short cut to reduce the sanctioned strength in IA&AD and not to increase promotional avenues to existing staff. It is also noticed that the present process has created displeasure and discontentment among the audit staff. The need of the hour is a comprehensive cadre restructuring in order to increase the staff strength, streamlining of the promotional avenues and to reduce the stagnation in each cadre. Hence, it is requested to issue direction to review the present rationalization process and to have discussions with the representatives of recognized federations for developing a fool proof system for the betterment of the audit staff. Sub: Additional chances to pass SAS (Civil Accounts) examinations – reg. Kind attention is invited to the circular referred above. It is communicated that the competent Authority has decided to allow two more consecutive attempts to pass two exclusive papers of SAS (Civil Accounts) Stream viz. PC-13(Accountancy) and PC-21 (Government Accounts) to those officials of A&E offices who have passed all seven common papers in permissible 10 (6+4 additional consecutive) attempts while appearing in SAS (Civil Audit) examinations as one time measure. In this connection, it is brought to your notice that there are aspirants in audit offices also who have already cleared seven or more papers in the permissible number of chances (10 + 4) but could not clear the remaining papers in the SAS examinations. Non-extension of the facility of additional chances to Audit staff is not justifiable and has also created disappointment among the audit staff. Hence it is requested that the above facility of additional chances allowed to the accounts employees should also be extended to the Audit staff. New Delhi – 110 124. Sub : Forwarding of Resolutions passed in the National Executive Meeting held at Ranchi – Reg. I am directed to forward the following Resolutions passed in the National Executive meeting of the National Audit Federation held at Ranchi on 22 October 2016. Resolution No.1 Implement revision of Allowances w.e.f. 1-1-2016. Resolution No.2 Implement Comprehensive Cadre Restructuring. The Central Government employees by and large are very much depressed on the inordinate delay in implementation of the revised rate of allowances as recommended by the 7CPC. The National Executive of this federation held on the 22nd October 2016 at Ranchi adopted a resolution in this regard. I am directed to forward a Resolution passed in the National Executive meeting for your kind consideration. Sub: Agenda meeting 23-11-2016 – Nomination of representatives – reg. I request you to kindly allow all the above representatives to attend the meeting. 9 – Deendayal Upadyaya Marg, New Delhi – 110124. Sub: Change in correspondence address – reg. AGCR Building, New Delhi – 110002. Sub: Nomination of members to the Departmental Anomaly Committee – reg. Ref: Your letter No. B-7/2016/SS dated 16-10-2016. I am directed to convey that the National Executive Meeting of National Audit Federation held on the 22nd October 2016 at Ranchi has nominated Shri. P.R. Rajvedi, Member, Departmental Council to represent in the Departmental Anomaly Committee of IA&AD. This issues in reply to your letter referred above. I hope the Anomaly Committee will function as a unit in the discussions in order to settle the pay related anomalies arising after the implementation of the recommendations of the 7CPC. I wish all success to the Committee. Sub: Air journey performed by non-entitled officials – pending approval – reg. Ref: Circular No.18-Staff/2013 No.726-Staff(Entt-I)/69-2013 dated 14-June-2013. Air journeys performed by non-entitled officials on tour to attend work at headquarters office in connection with Audit Report, UN Audit, attending training programmes at different training institutes etc. are to be sanctioned by the Deputy Comptroller and Auditor General as per rules. Field offices were forwarding applications in respect of non-entitled officials to the headquarters office for approval. In order to maintain uniformity and speedy disposal of these cases, instructions were issued by the headquarters office vide circular referred above. It was also directed that the Head of the Department (HoD) is competent to grant permission to the non-entitled officials to travel by air taking into consideration the work exigency and time-paucity. After completion of the tour/journey, the HoD must send these proposals for obtaining ex-post facto approval of the Competent Authority at the headquarters in respect of Air-journey performed by non-entitled officials with proper justification for approval. Accordingly, many proposals were sent by field offices to the headquarters office for obtaining ex-post facto approval of the Competent Authority. Complaints have now been received from various field offices that many of such proposals are pending with the headquarters office. As per information received, proposals sent from field offices since 2014 are pending in the headquarters office. All those applications were initially scrutinised and sanctioned by the respective Principal Accountants General / Accountants General under authority and subsequently forwarded to the headquarters office for ratification. Inordinate delay in the headquarters office even after strict scrutiny in the field offices is not justifiable. Hence, it is requested to issue directions to clear all pending proposals in respect of air journeys performed by non-entitled officials submitted for ex-post facto approval of the Competent Authority without further delay. Sub: Promotion and financial upgradation under MACPs – regarding. Ref: 1. Letter No.04 – Staff(Appt. )/PC Cell/01-2016 dated 9-08-2016. This federation letter No.NAF/2014-16/06 dated 10-08-2016. As per the Ministry of Finance (Department of expenditure) resolution dated 25-07-2016 implementing the recommendations of 7CPC, the benchmark for performance appraisal for promotion and financial upgradation under MACPs was enhanced from “Good” to “Very Good”. But, the headquarters office vide reference cited at 1 above has directed the field offices to hold all promotions/financial upgradation under ACP/MACPs till further orders. Field offices are strictly following this direction and with holding the regular promotions even for which the panel has already been approved. We have requested your good self vide our letter under reference 2 above not to withhold regular promotions/ACP/MACPs to those officers who are already in the approved panel. 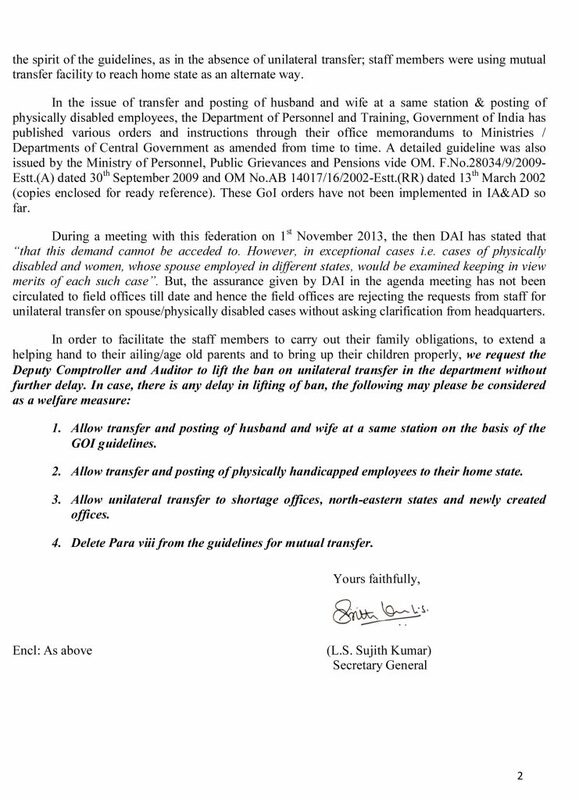 Kind attention is invited to the headquarters Office Memorandum referred at 3 above, issued from GE-1 section. 28 Senior Audit Officers were newly inducted to the cadre of IA&AS and directed to report for training at Shimla vide OM dated 18-08-2016. In this connection, it may kindly be noted that the promotion orders in respect of the above 28 officers were issued on 9-8-2016. The headquarters office on 9-08-2016 issued orders for withholding promotions to group B & C officers but simultaneously inducted officers in the cadre of IA&AS through promotion on the very same day. Group B and C employees of IA&AD are very much disappointed on the double standards of the headquarters office. 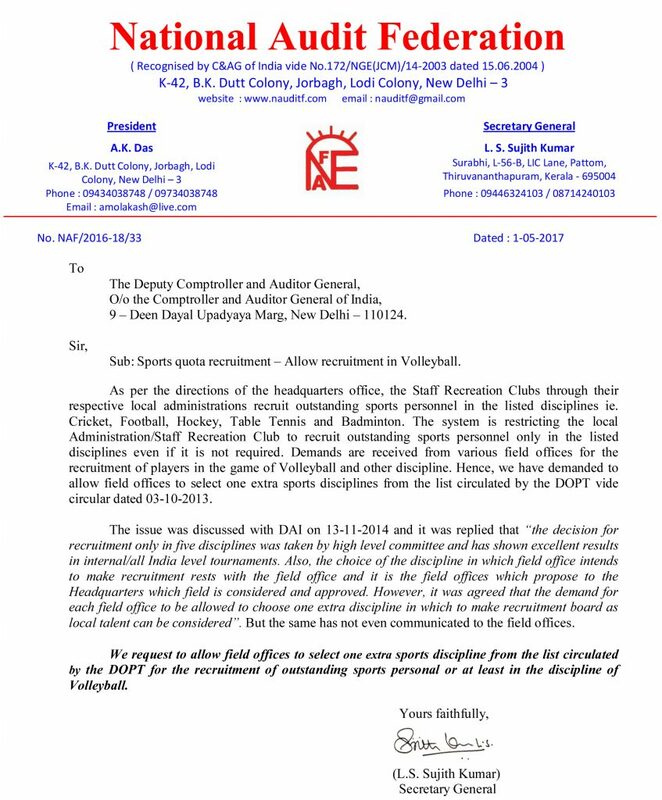 Blocking/denial of the normal promotions of the employees in the absence of any such orders from the Government of India is not justifiable. Hence, it is requested to intervene in the matter personally and direct the concerned officers to withdraw the letter under reference 1 with immediate effect. 9 – Deen Dayal Upadyaya Marg, New Delhi – 110124. Sub: Subordinate Audit/Accounts Service Examinations – allowing unlimited chances – reg. Ref: Judgment of the Honorable CAT, Chandigarh bench against O.A.No.060/00691/2016 dated 02-08-2016. Kind attention is invited to the Judgment cited (copy enclosed). The Honorable Central Administrative Tribunal, Chandigarh bench has directed to consider the representations of the applicants who were denied permission to appear for SAS examinations due to exhausting of ten chances, before the date of examinations. 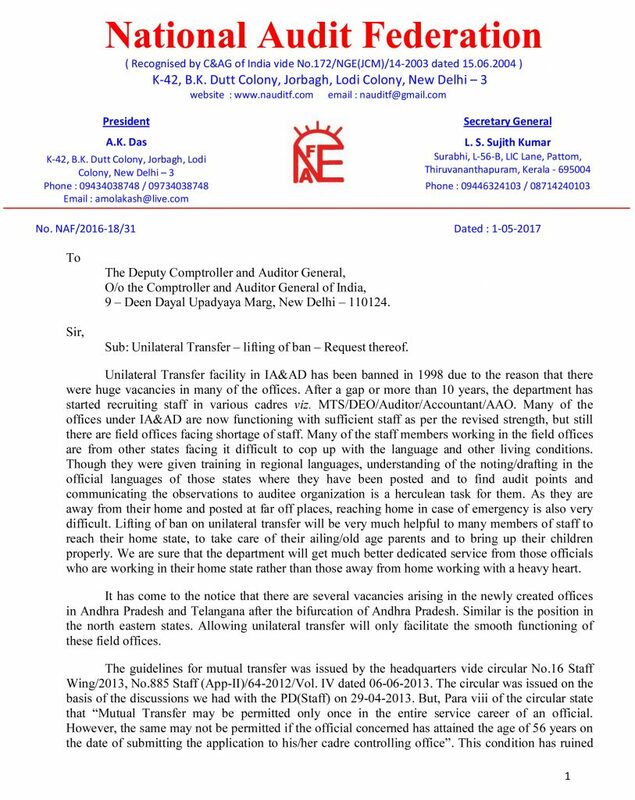 In this connection, I am directed to invite your attention to demand No.8 of the charter of demands submitted by this federation on 8-08-2016 requesting to allow unlimited chances to all those employees who are aspirants of the SAS/RAE/CPD/Incentive examinations and could not attend the same due to exhausting of the limited number of chances. 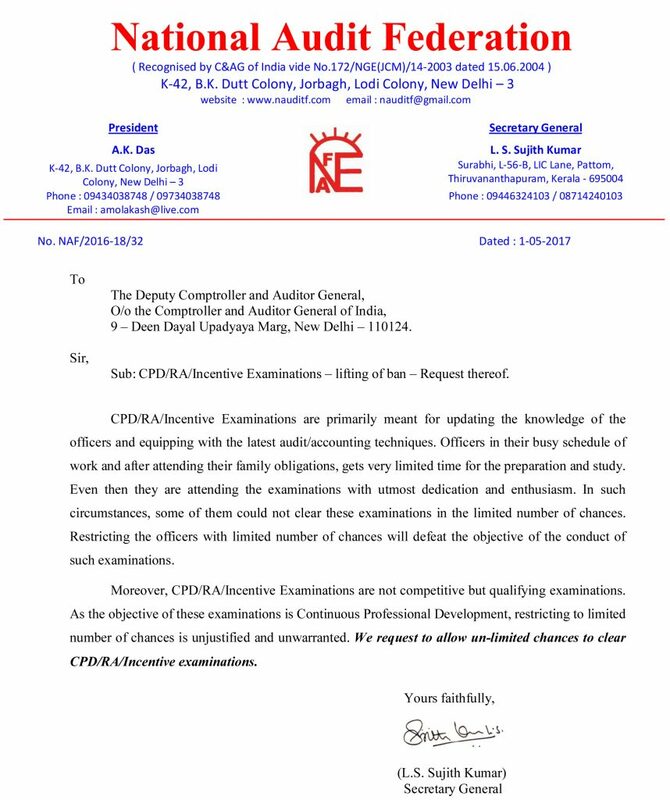 Limiting the number of chances in these examinations will only demoralize the employees who could not achieve within the specified chances. Considering the true spirit of the judgment of the Honorable Tribunal, I request you to issue directions in this regard at the earliest. Sub: Grant of `5400 Grade Pay after four years service in `4800 GP – regarding. Ref: No.A-60015/1/2014/MF.CGA(A)/NGE/7th CPC/214 dated 10th August 2016. Kind attention is invited to the reference cited wherein the Controller General of Accounts, under the Ministry of Finance has notified the details of posts in CCAS cadre carrying existing Pay Band and Grade Pay corresponding to the revised Pay Matrix Level (copy enclosed). In this connection, I am to bring to your kind notice that the 7CPC vide para 11.12.139 observed that “non functional upgradation from GP 4800 to GP 5400(PB-3), on completion of 4 years of service, has been accorded to a number of posts by the Government in 2008 viz., Delhi and Andaman & Nicobar Islands Civil Service, Delhi and Andaman & Nicobar Islands Police Service, Officers of the Central Secretariat Service and those of Central Secretariat Stenographers Service as well as other similarly place Head Quarter Services. This has also been extended to Group ‘B’ Officers of the departments of Post & Revenue. While extending this benefit, Officers in GP 4800, both in Head Quarters and in the field formations of these two organisations have been covered. In 2015, this benefit was also extended to Section Officers in the Indian Coast Guard”. Again, in para 11. 12. 140 further clarified that “there is no justification for excluding officers in the organised accounting departments who are at GP4800 from this dispensation. It therefore recommends that all officers in organised accounts cadres (in the Indian Audit and Accounts Department, Defence Accounts Department, Indian Civil Accounts Organisation, Railways, Post and Telecommunications) who are in GP 4800 should be upgraded, on completion of four years’ of service to GP5400 (PB-2),viz., Pay Level 9, in the pay matrix. Government, when issued notification on implementation of 7CPC recommendations, the upgradation issue corresponding to the cadres in the Defence Accounts and Railway Accounts were referred to the DoPT for obtaining comprehensive view. It is understood that this has created some sort of confusion in the headquarters office. Now, from the implementation order cited above issued by the Controller General of Accounts which is directly under the Ministry of Finance, it is clear that the government have no objection in implementing the upgradation in IA&AD, Civil Accounts Organisation and Post and Telecommunications departments. Hence, it is requested to implement the recommendations of the 7CPC as accepted by the Government in its true spirit. It is also requested to issue a detailed order showing the revised pay structure in the new pay matrix against each cadre in IA&AD to the field office for compliance. Kind attention is invited to the letter No.04 – Staff(Appt. )/PC Cell/01-2016 dated 9-08-2016 issued by the Sr. AO (Appt. III). It is directed to withhold promotions/financial upgradation under ACP/MACPS till clarification in this regard is received from the Ministry. In this connection, it is submitted that a promotion/upgradation under ACP/MACPS is career advancement for the employees after putting so many years of service. As per the existing system, it is considered as a recognition to the experience/service rather than a financial upgradation. Delaying of such career advancements for want of certain clarification from the ministry is down grading the morale of the already stagnated staff. It affects the mental health as well as the financial conditions of such hardworking staff under your esteemed organization. I therefore request you to issue orders directing the field offices not to withhold promotions/upgradation under ACP/MACPs to those officers who are in the list of panel which is already approved and finalized for granting such promotion/upgradation. If necessary, an undertaking in this regard shall be obtained from such officers in case of reversion/denial. The 10th Biennial conference of National Audit Federation held in New Delhi from 16th to 18th July 2016 unanimously passed the following resolutions and directed to forward the same to the Government of India. The general body also directed to request the Government of India to consider these genuine demands of the Central Government employees positively. Sub : Agenda Meeting – Reg. I am directed to submit herewith the charter of demands as finalized in the 10th Biennial Conference of National Audit Federation held at New Delhi from 16th July to 18th July 2016. I request to grant an Agenda Meeting of the office bearers of the Federation with you on an early date to discuss and settle these demands. Sub : Forwarding of Resolutions passed in the 10th Biennial Conference – Reg. I am directed to forward the following Resolutions passed in the 10th Biennial Conference of the National Audit Federation held in New Delhi from 16th to 18th July 2016. The Conference unanimously resolved to urge upon the CAG of India to intervene and to issue directions for the immediate settlement of the above issues. Sub: List of office bearers of National Audit Federation for 2016-18 – intimation. I am directed to communicate that the following persons have been elected as office bearers of National Audit Federation for 2016-18 in its 10th biennial conference held at New Delhi from 16th July 2016 to 18th July 2016 and have taken over charge with effect from 18th July 2016. Encl: Copy of the notification of election results by Election Officer. Subject: Courtesy meeting with Deputy Comptroller and Auditor General – Nomination of representatives – reg.